A just-turned-20 driver won NASCAR’s biggest race, the Daytona 500, in his second Sprint Cup start. He had a yellow “rookie stripe” on the back of his car. Yet according a just-implemented NASCAR rule Trevor Bayne is not eligible to contend for this season’s Sprint Cup Rookie of the Year. Starting this year NASCAR requires drivers who compete in both Cup and Nationwide Series races to declare in which series they want to receive points. They can continue to race in both but they can’t compete for championships or other awards in both. 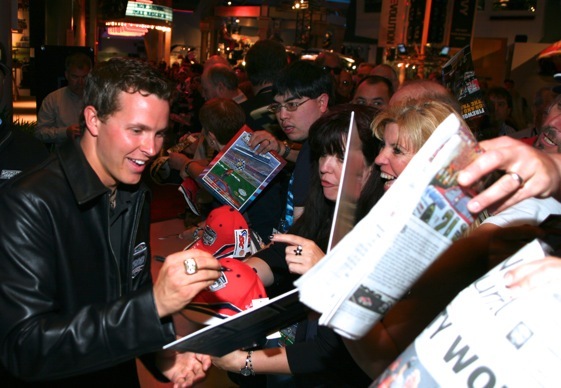 When young Bayne signed up awhile back he declared for the Nationwide Series, in which he plans to run a full schedule. That means that he could go on to have the greatest Cup season in the history of the series and not be eligible for Rookie of the Year or – as it stands now – even the championship. Can you appreciate the irony? The new rule was intended to prevent Cup drivers from running off with the Nationwide championship as they’ve done year after year. Nobody in their wildest dream imagined it might keep a Nationwide driver from winning the Cup title. Of course we’re putting the cart before the championship. Winning one race – albeit the biggest in the sport – doesn’t necessarily put Bayne on the path to the Cup title. His Wood Brothers team doesn’t even plan to run the full Cup season, although those plans might change after last Sunday’s amazing race. You can bet NASCAR would be delighted to see a bright young personality like Bayne on the track in every Cup races, especially if he keeps driving the legendary Woods Brothers Ford the way he did Sunday. It would be the greatest feel-good story to come along in years. So here’s a suggestion: if the Wood Brothers should secure a full-season sponsorship for their car that would enable Bayne to run all the Cup races, NASCAR should simply change the rule prohibiting duel title attempts. If anything, amend the rule to permit a driver to change his mind by mid-season and declare for the other series title. NASCAR had good intentions, trying to arrange it so that a Nationwide-only could win the Nationwide Series championship. But even that wasn’t going to solve the second-tier series problems. As we saw in the Nationwide opener at Daytona last Saturday, Cup drivers are going to continue to run Nationwide races – especially the more lucrative ones – win them, and scoop off the gravy. All the rule did – or could do – is prevent a sizzling young talent like Bayne from competing for deserved honors in the Cup series. If NASCAR can change its car rules virtually in the middle of a race, it can amend its new no-double-points rule too, because right of the box Master Bayne threw a monkey wrench into it. Steve863, if he now decides to change his mind and run for Cup points, he still loses his Daytona points. He also still has to be in the Top 20 in points to have that win get him in the Chase. Plus he either has to win more races or be higher in the top 20 than the other guys with 1 win. Its not as simple as just saying “ok i want to earn points in cup now. You can’t pick and choose as the season goes along. The media is hyping this up pretty good, but I think people need to take a step back and look at the big picture. This team doesn’t have enough sponsorship for all the races, hes on loan from Roush and racing on non plate tracks is a whole other animal. What if he crashes his Cup car in the next few races, falls out of the Top 35 in Cup and misses races the rest of the season. He has no chance to make the Chase in Cup and has no chance at the NW title now. I think he’s making the right decision staying in NW. He has a better chance at that title than he does going for a Cup title. This may allow him to get sponsorship on his NW car and that’s good for him and that team. The problem with the ruling, as I understand it, he still can’t keep the points from Daytona. Perhaps the oversight was in forbidding a Nationwide driver to run for BOTH titles. If the intent was to keep Cup drivers from overpowering the lesser series, was it really necessary to ban Nationwide drivers from running for the Cup title? What are the realistic chances ofthat happening? After all, wouldn’t it be a great ‘feel good’ story if someone from the nationwide series could give the ‘big boys’ a run for their money for a change? I know ..sadly that this is a one year deal with the Wood Bros…..big money is not going to allow them to keep this kid no matter how much he wants to stay….NASCAR…will not have it. That said, they should ( whatever is fair to all drivers )be flexable with this poorly scripted piece of “regulation”. nascar made a rule at the begiaing of the year and regardless of who gets caught up in the rule I would hope that nascar would stand behind their rule change . we have been hammering nascar for changing the rules in the middle of the year and I would hope that they would not let the results of one race change that. I hope Trevor will understand the rule . to bad for him . but his chance will come . The problem with the “Declare” rule is that the competitors have to declare before the season starts, and at a point the some of them are still getting sponsor deals worked out, and they do not know what their options will be. It is in the competitor’s interests and NASCAR’s interest to have the series option open long enough for last minute agreements to come together. Currently, if Trevor Bayne does not have the option to run for the chase, NASCAR will miss out on the best opportunity they have had since Jeff Gordon entered cup racing in 1993 to match up new, younger fans with a new younger driver. And there is not anyone with any knowledge of the sport that would not like to see the Wood Brothers back in the garage every week, and there could be several other competitors and sponsors rethinking their series decision. In my opinion, they should change the rule to have the competitors declare by the second or third race. NASCAR inadvertently shot themselves in the foot with this ruling, but there is time to correct it! Trevor is contracted to drive for Roush not the Wood Bros. he is just on loan. I wouldn’t expect him to be driving the 21 car next year David Ragen will be unemployed next year. While your statement about the new rule is factual, your summation is way off base. Trevor has the option to change his mind. NASCAR announced this yesterday. He can choose to run points in Cup or stay and run points in Nationwide. He will race in as many CUP and Nationwide races as financially and ride possible. I can believe that sponsors are reaching out to the Wood Brothers with opportunities to run more races. Sunday’s race was one of the funnest races in a long time. Good for NASCAR! this is good to here good for trevor . I am happy for him .